Eladio Pereza consoled outside the court room by his companion. 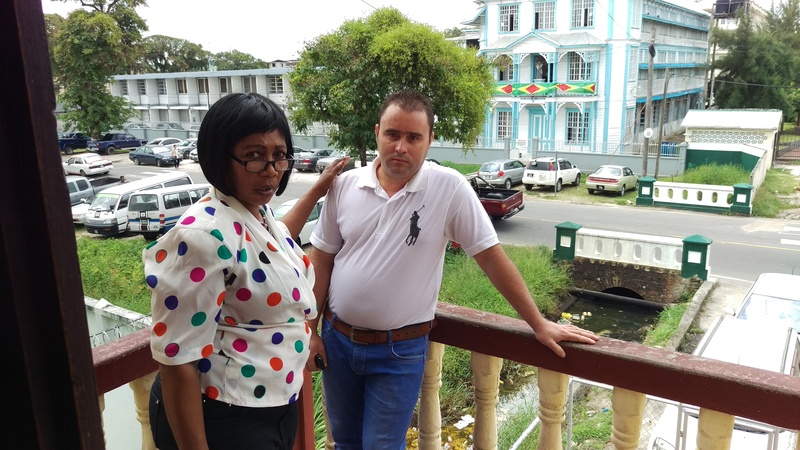 Cuban national and owner of Providence’s Bollywood Club, Eladio Pereza was Tuesday freed of human trafficking charges by Chief Magistrate Ann McLennan. Pereza’s charge read that he trafficked a Cuban female national for sexual exploitation between March 1, 2016, and January 20, 2017 at Bollywood Club. The chief magistrate read her decision today saying the prosecution did not satisfy their case beyond reasonable doubt that the Cuban club owner was guilty of trafficking the virtual complainant. She further said that the defendant’s defense was corroborated by the virtual complainant in the matter. Pereza, 34 years of Providence Public Road on the East Bank of Demerara, was charged in January for trafficking a female of Cuban nationality for the purpose of sexual exploitation. In January, ranks from the Counter-Trafficking In Persons Unit conducted two raids on the East and West Bank of Demerara at popular locations. Some eight victims were rescued. Chief Magistrate Ann McLennan heard in January that Pereza lived in Guyana for two years, is married to a Guyanese woman, and is the owner of the Bollywood Hotel and Club. Pereza was provided a translator in the Court throughout his trial. He had initially told the court he does not know about the charges against him, and maintained a not guilty plea. Police prosecution had objected to bail based on the nature of the offense, and the fact that the accused is a foreign national. Although the trafficking charge against Pereza has been dismissed, he still has an outstanding matter for intention to commit a felony. He will return to court on March 15.